You'll need a fast connection for this, because it's over an hour long, but if you can watch it, I think you'll find it fascinating. 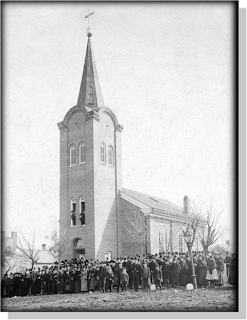 It's about the history of a particular church congregation here in Jefferson City, but as with so many things, a careful microscopic view can provide great insights into the macroscopic panorama. And I admit my bias, of course, totally, because of my connection to the church and to the speaker. Yet I think the talk offers interesting insights into what life was like for our immigrant forebears. It examines the adoption of the English language; the embracing of American democracy; the contributions in the realms of education, music, construction, business, and civil rights. It raises thoughtful points about what it means to be an American, and to become an American--something that is common to every American's experience, on some level, in some generation. One of the wonderful points he makes, for instance, is about how the language of the Old World persisted among church congregants--how catechisms, prayers, hymns, and Bible verses were some of the last components in an immigrant's life to change to the new language. For example, he points out how even today, "newer" wordings of verses such as "My cup overflows" just don't feel as good as "My cup runneth over." Imagine how foreign such poetic passages would sound in a completely different language. The program took place on January 22, 2009, at the Missouri State Archives here in Jefferson City. So here's a link to the talk, "Americanization of a German-Immigrant Church," presented by Walter A. Schroeder.